is hard to hold because he is learning to read. not like the animal in its cage, not quiet. Laurie Lamon was selected by Donald Hall, Poet Laureate 2007, as a Witter Bynner Fellow for 2007. Her collections are The Fork Without Hunger and Without Wings. She is a professor of English at Whitworth University and poetry editor for the literary journal Rock & Sling. 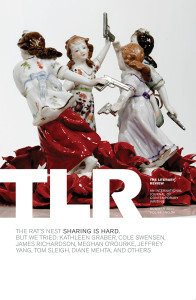 “The child is tired” appeared in The Rat’s Nest (TLR Summer, 2011).